Social justice, access to education, diversity, healthcare, sharing the joy of art and preserving the environment are among the causes that animate the 2016 graduates of the Indiana University Lilly Family School of Philanthropy. The 66 women and men earning Ph.D., Master of Arts, and Bachelor of Arts degrees or graduate certificates in Philanthropic Studies represent the largest number of graduates in the history of the school and its predecessor, as well as the largest number of B.A. recipients (18) to date. The fourth group of students to be graduated since the school’s founding in 2012, they will receive their degrees during Indiana University-Purdue University Indianapolis (IUPUI) commencement ceremonies May 8. The Lilly Family School of Philanthropy, the nation’s first school dedicated to research and teaching about philanthropy, also will hold a school graduation ceremony at the Indiana Convention Center in Indianapolis immediately following the IUPUI commencement. IU First Lady Laurie Burns McRobbie will be among the school’s graduates, earning its Master of Arts in Philanthropic Studies degree. She will be hooded by IU President Michael A. McRobbie, who will speak briefly at the school ceremony. Derrick Feldmann, founder and president of Achieve, founder of the MCON national conference on Millennials and social good and creator of The Millennial Impact Project, will keynote the school’s ceremony. Feldmann is a 2004 alumnus of the school’s master’s degree program. The 2016 graduates represent a wide range of experience from veteran philanthropic sector leaders completing graduate-level programs that expand their knowledge and enhance their careers and organizations to civically engaged undergraduates. The IU Graduate and Professional School’s Elite 50 students list includes M.A. recipient Le Yang. Master’s degree alumni Wyatt Jackson and Melanie McKitrick also were honored on the list, as each pursued an additional degree. The William M. Plater Civic Engagement Medallion was awarded to bachelor’s degree recipients Brittany Florentine and Stephanie Fulk, and master’s degree recipient Adrienne Nordman. The Undergraduate Chancellor’s Scholar for the Lilly Family School of Philanthropy is Jonathan Ferguson. 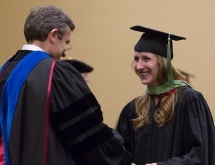 An IUPUI Women’s Leadership Award was presented to bachelor’s degree recipient Taylor Dooley. Dooley and Abe Roll participated in the Honors College program and will graduate with honors.